Every Dorothy should have a pair of ruby shoes, and these toddler size ruby shoe covers can make that happen! These ruby slipper covers have shimmering red sequins and red satin bows on the toes. A Velcro strip in the back allows for adjusting to your child's size and an elastic string on the bottom keeps the shoe covers securely in place. A great addition to any toddler Dorothy costume. 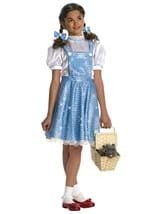 Add from our other Dorothy costume accessories to get a detailed look!